Austin was where Vaughan called home, after moving here at the age of 17, when he began his music career. August 27th marked the 21st anniversary of Vaughan’s death. With his legacy, he left behind six Grammys, five W.C. Handy Awards, inducted into the Blues Hall of Fame (post-humerously), a Fender produced “Stevie Ray Vaughan Signature Stratocaster” and most noted,his musical influence. 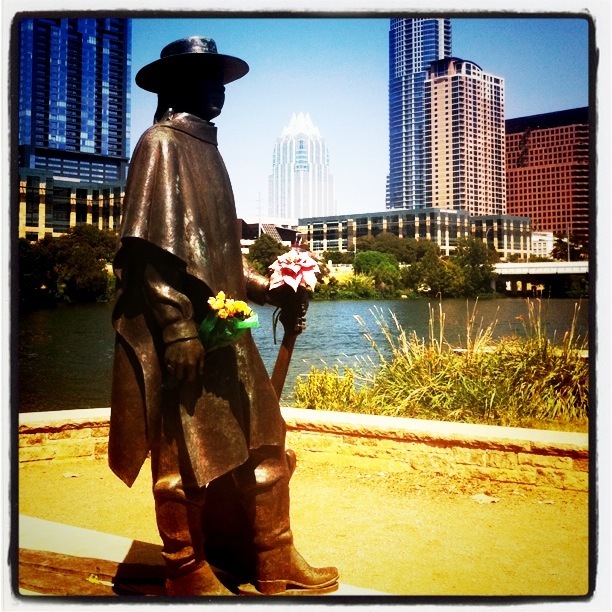 In 1993 City of Austin erected a statue in memorandum of the Blue’s Hall of Famer along the shore of Town Lake, just steps from the Auditorium Shores stage location where Vaughan had performed many times. Fans from all around the world come to pay tribute, often leaving flowers and assorted memorabilia. Even after over 20 years of the loss, Austin still revers Vaughan’s presence and is eternally grateful for the musical history his legacy has bestowed. And, this my friends, is just another reason why I love Austin. ← T.G.I.- postcard – F.!! Austin = music. Great post.